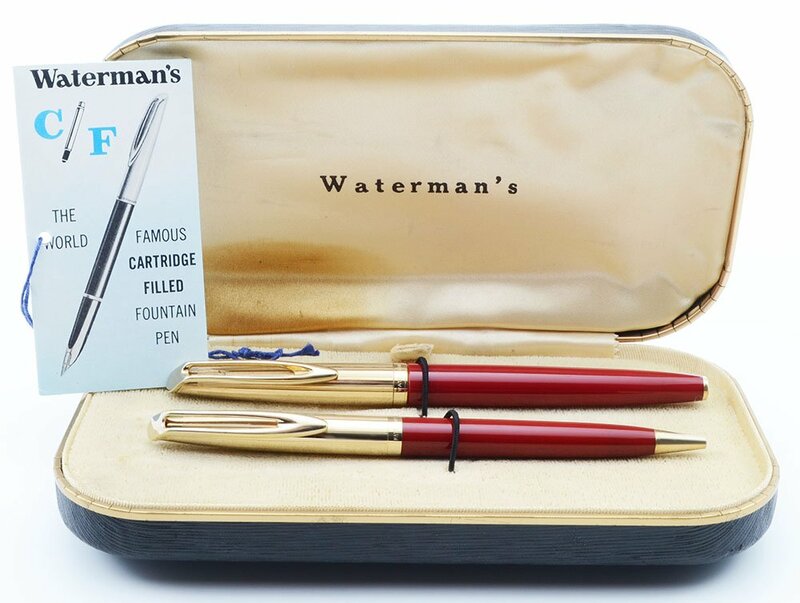 A very cool Waterman CF set from the 1950s. It has a ballpoint pen and a fountain pen with a 14k fine nib. Both have red barrels and gold plated cap. 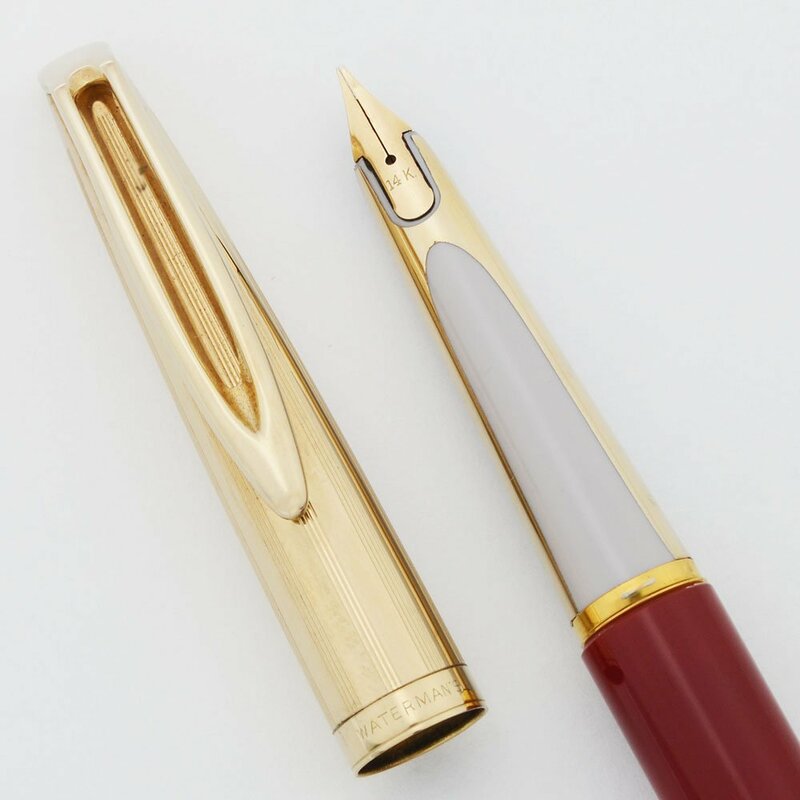 The pen has a cream section with gold bands going up to the nib feed. They ship in a Waterman CF box with one new CF cartridge. The set is in excellent condition. Length Fountain pen is 5-5/16"; Ballpoint 5-1/8"
Filling System FOUNTAIN PEN: Cartridge/converter. New converter included. Here's the challenge with Waterman CFs: the cartridges and converters are no longer made and are close to impossible to find. To use these pens, most modern day owners resort to refilling the cartridges with a syringe. The box still has one new cartridge under the tray which may be dried up, and one dummy cartridge. BALLPOINT: The refill in the ballpoint does not work, and the Waterman CF refills are no longer made. Must de Cartier ballpoint will fit. It has to be the original Must de Cartier refills, not another Cartier style, you will want to find the kind with the slightly flared open top. Color Red, probably lacquer bodies with gold plated smooth caps. The section is a cream color with gold side bars running to the nib feed. Condition Superior condition. The fountain pen barrel looks excellent with just some light signs of wear. The section has a small crack below the feed as can clearly be seen in the photo below. The nib has a little shaved area near the tip of the right tine, probably a remnant of the original nib manufacturing and finishing process. The gold cap is excellent, though there is light surface pitting toward the top. Imprints are clear. The ballpoint barrel and cap have some ligt wear. It sits in the original black ribbed Waterman's box with velvet and slightly stained silk interior. Instructions for filling the pen and pencil are included and the bottom of the box lifts off to reveal one ink cartridge.